Social media went from being a tool for people to catch up and connect with old friends and new, to becoming one of the most basic methods for people and businesses to grow their audience. But it's not always as simple as creating content and gathering lots of views, likes, and shares. Content marketers do extensive research to find out what works well with whom. BuzzSumo helps you do that; and then some. No matter what type of business you're in, or how big your business is, you need to monitor social media data to better understand your market and to be able to reach out to new ones. But content curation can be a huge time-consuming headache. Sitting all day reading articles, going through the web, and searching for things relevant to your niche can be exhausting; especially with so many sites republishing the same old stuff. BuzzSumo makes this easy. BuzzSumo is a web-based software program. It's a social media analytics and curation tool for content marketers. Many of them have been using BuzzSumo to go through the web for content based on search queries and reports on its success based on likes and shares. Being able to analyze which content performs best on any market niche is a huge advantage. With BuzzSumo's advanced social search engine, you can identify the most shared content for a certain topic, author, or domain. This helps content marketers understand what type of content resonates well with their market and use it as a guide to creating their own. Let's tackle the different features and see how it'll help you create better content. BuzzSumo has created an incredibly handy feature that lets you set up custom alerts to notify about specific keywords. Many have been let down by Google Alerts, but BuzzSumo delivers. Customize your alert to monitor for the brand or keyword mentions in Title and Topic, or Title, Topic and Article Text. You also get several options as to how you get these alerts. BuzzSumo can give it to you in real time, or as a daily digest email. You can even specify a minimum social share threshold. Aside from that, you can also set up a link, author, and domain alerts. While finding content is one of BuzzSumo's strengths, it also does more. Being able to identify influencers in your market. Their powerful influencers search lets you find key influencers in any topic area or location. You can filter them by reach, authority, influence, and engagement. BuzzSumo also lets you follow these influencers from within the platform. You can see what they share, the topics and domains alike. The great thing about it is that you can export all these results as a CSV or Excel sheet. It's been very clear how well BuzzSumo helps you make content research faster and easier. By being able to find the most shared content on the web with an input of a certain topic, keyword, or competitor, content marketers get to plan and strategize with ease. These results help get important questions answered and gives great insight as to how you should go about with your social media marketing. Being able to discover, curate, and share content is made easy and infinitely faster on BuzzSumo. Everything you find can be filtered and reviewed the way you want it. You can share content directly from within BuzzSumo and even schedule it by adding it to Buffer. Set up alerts according to the reports you 've received and to curate new content in your topic area. Do so much more with your time with all the powerful search tools. One big worry that businesses have is their competitor. But even that worry is diminished because BuzzSumo lets you keep tabs. Get competitive intelligence on your competitors content by entering their domain and using their filters to find their most shared content and the networks they're using. You can also see who shares their content and filter them by the number of followers or engagement. Setup content alerts when a competitor publishes something and get detailed content performance reports. You can compare your performance with your competitor's with BuzzSumo's incredibly helpful comparison reports. Monthly and yearly plans are available for you to choose from, the latter offered with a 20% discount. You can start with their Pro Plan at $99 per month. Get the Agency Plan to get all the Pro features plus the Facebook Analyzer at $299 per month; and the Enterprise Plan at $699 per month. 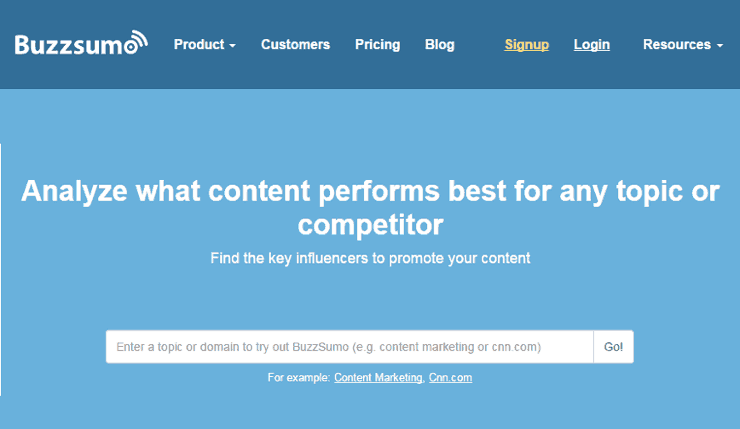 Get their free trial and see how easy your life as a content marketer can be with BuzzSumo. It's so easy and so good that it almost feels like cheating.